The First Contact Memorial commemorates the first documented contact between the Indigenous Australians and Europeans. This project was first discussed by the then President of the Netherlands Senate, Senator Yvonne Timmerman-Buck when she led a Netherlands Parliamentary delegation to Western Cape York Peninsula in 2006. 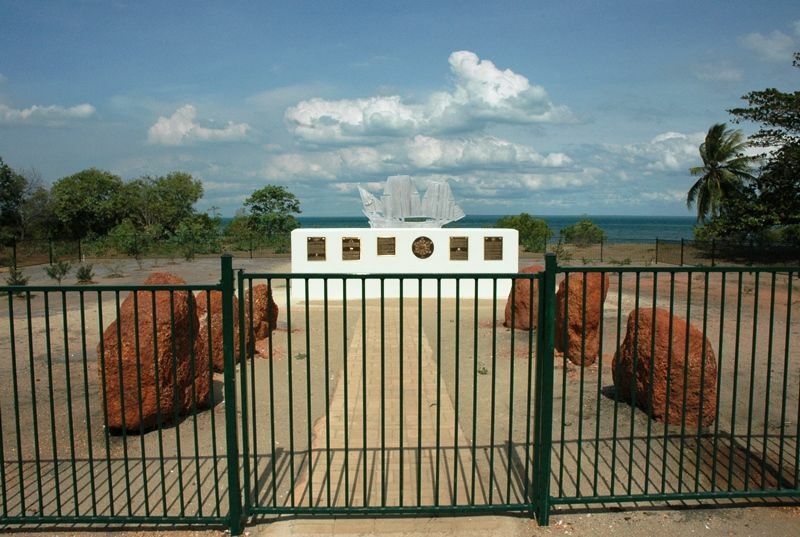 Following discussion between the former Netherlands Ambassador, His Excellency Willem Andreae, with Traditional Owners and the Mapoon Aboriginal Shire Council in 2011, historian Geoff Wharton was engaged by the Mapoon Aboriginal Shire Council and the Queensland Government to develop a design for the First Contact Memorial. Led by the Honorary Consul of the Netherlands in Queensland, Captain Kasper Kuiper RON, a working group was established to assist with the planning and logistics of the project and opening ceremony. A silhouette of the Duyfken was manufactured in Brisbane by Urban Art Projects (UAP) from a single piece of 20mm thick marine grade aluminium plate and erected in a concrete block structure by the Mapoon building works crew. Traditional designs and art work for some of the cast bronze plaques was created by Mapoon Indigenous artists. The position of the silhouette as visitors approach the Memorial makes the Duyfken appear to be anchored in Post Musgrave with its bow pointing upstream towards the Wenlock (formerly Batavia) River. In 1606, Dutch VOC ship the Duyfken reached the west coast of Cape York, in northern Queensland. On the peninsula, the crew came into contact with the Indigenous people of Australia. This event was later documented as the first meeting on Australian soil between the indigenous people of Australia and Europeans. The memorial was officially opened by Her Excellency the Governor of Queensland, Ms Penelope Wensley AC, with Mr David Kempton M.P. representing the Premier of Queensland and Mr Fred de Graaf, President of the Netherlands Senate, with the Elders of Mapoon on Monday 27 May 2013. This date also marked the commencement of Australia’s National Reconciliation Week, 2013. Central welcome plaque with cultural information and a round seasonal calendar plaque with six totem designs around the outer edge. Mapoon from 1974 to today. A plaque describing Mapoon’s re-establishment in the 1970s to today. Central official opening plaque and a plaque recording the sponsorship and construction contributors. Early European contacts 1606-1756. A plaque with the logo of the Dutch East India Company (Verenigde Oost-Indische Compagnie – VOC) describing the four known voyages by VOC vessels. Mapping Queensland’s West Coast – Voyage of the Duyfken. (The 1670s chart showing the route of the Duyfken reproduced on two ceramic tiles). Other European contacts with Western Cape York Peninsula. A plaque describing the voyages of Torres, James Cook, Matthew Flinders and Charles Pennefather. Includes the Bam Bam fruit type specimen found by botanist Robert Brown at Pennefather River in 1802. On the occasion of the unveiling of the First Contact Memorial, the Netherlands Embassy has produced a book on the VOC ship the Duyfken. The official launch of this book took place in Sydney on 28 May 2013.